Uppsala, Sweden/Düsseldorf, Germany—November 26, 2013—IAR Systems®, the leading provider of embedded development tools, and Renesas Electronics Europe have teamed up to offer a development toolchain for Renesas’ 32-bit RX microcontroller platform that facilitates compliance with the international umbrella standard for functional safety IEC 61508. Functional safety is one of the most important features in industrial automation systems today. To ensure functional safety, system developers have to consider development tools as an integral part of the system certification in addition to the normal development. The proof of compliance for the tools increases cost and time of development. To solve this problem, IAR Systems now provides a certified version of the complete compiler and debugger toolchain IAR Embedded Workbench® for RX. The build chain of IAR Embedded Workbench for RX has been tested and approved according to the requirements on support tools put forth in IEC 61508, as well as the standard for automotive safety-related systems ISO 26262. The quality assurance measures applied by IAR Systems and the included Safety Manual allow application developers to use IAR Embedded Workbench for RX in safety-related software development for each Safety Integrity Level (SIL) according to IEC 61508 and each Automotive Safety Integrity Level (ASIL) of ISO 26262 without further tool qualification. 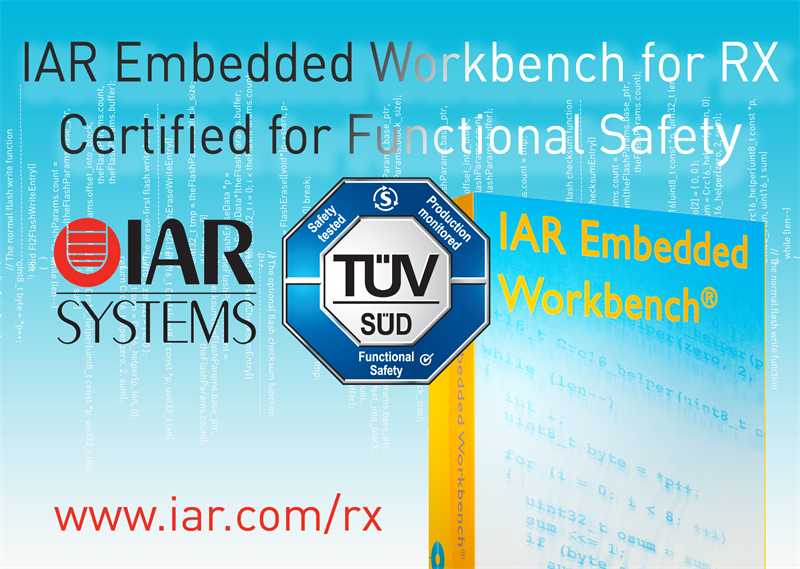 IAR Embedded Workbench for RX is certified by TÜV SÜD. The certified version is delivered with a functional safety certificate, as well as a safety report from TÜV SÜD and a Safety Manual. With the certified tools, IAR Systems provides a Functional Safety Support and Update Agreement with guaranteed support for the sold version for the longevity of the contract. In addition to prioritized technical support, the agreement includes access to validated service packs and regular reports of known deviations and problems. More information is available at www.iar.com/safety.